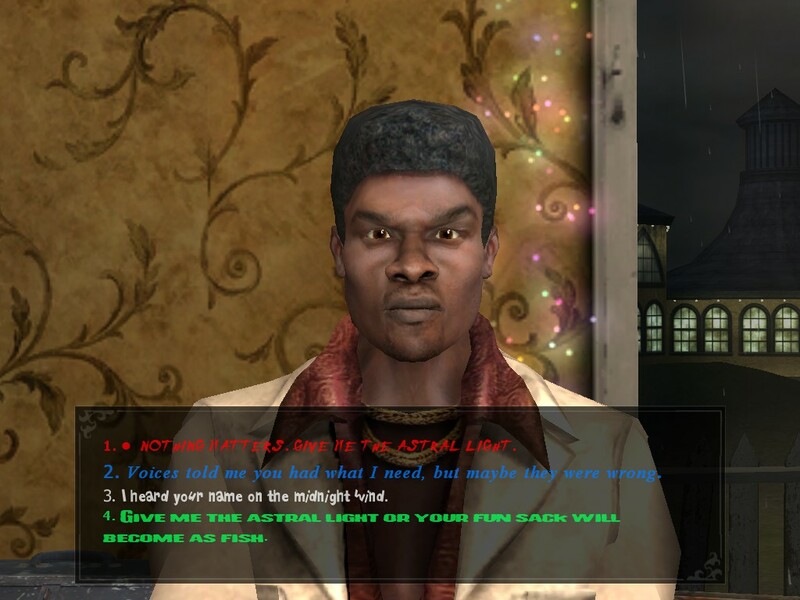 Vampire: The Masquerade – Bloodlines was the third and final RPG from Troika Games, the company founded by the Fallout veterans Leonard Boyarsky, Tim Cain and Jason Anderson. The game was created using an early build of Valve’s Source engine, was rushed out by Activision and suffered heavily from being released in the same day as Half-Life 2, resulting in numerous bugs and weak sales. However, over time it became a cult classic. What’s so great about VtM:Bloodlines? A lot of things, ranging from the overall storyline to minor details. The game manages to do the impossible, merging classic RPG gameplay with modern FPS visuals. You experience the game as one of seven different vampire clans, who have different vampiric powers, and you can play Bloodlines like a shooter, a stealth game, a hack’n’slash or for a good part even as an adventure game, solving many situations without force, but by lock-picking, hacking, persuading, intimidating or seducing people. Besides these various options, the game world itself manages to bridge two other extremes: you get large playable hubs that open up in the progression of the storyline and offer dozens of unique side and main quests, but the quests themselves are more linear in style and convey plot and atmosphere better than any sandbox game could do. 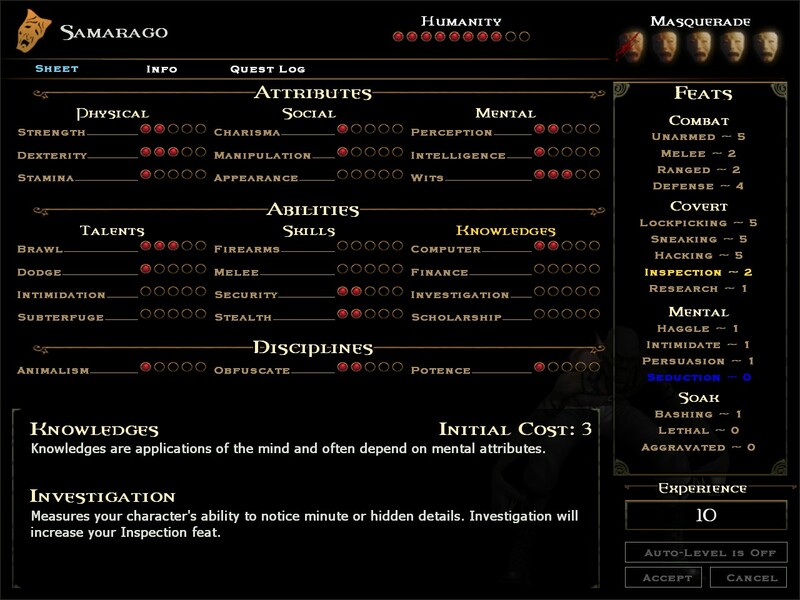 Still, there are often multiple approaches possible in a quest depending on your character, and other characters will react accordingly to your behavior, coming alive due to the great facial animations of the Source engine, some of the best voice-overs in gaming history and the witty writing of Brian Mitsoda. He created many very memorable characters and funny dialogs for Bloodlines, especially for the mad Malkavian clan, that has entirely different dialog options. Imagine talking to a TV set or to a STOP sign! Imagine a thin blood making references to the whole story that you can only understand once you finished it! There are other great moments in the game where a character revelation may surprise you with a deepness unusual for a computer game and some of the different endings may make you laugh out loud, showing at the same time that everything in the plot made sense right from the start, but probably not exactly as you suspected. The beautiful handcrafted levels push the alpha version of the Source engine to its limits and enable you to visit the greater area of Los Angeles; the windy beaches of Santa Monica, the busy skyscrapers downtown, the fancy streets in Hollywood and even the far-eastern charm of Chinatown, with excursions to several external locations like strange mansions or dark caverns thrown into the mix as well. Your adventures will vary from straightforward fights against humans, vampires or other supernatural creatures to solving the mystery of a haunted hotel without any combat, a level that is regarded as one of the spookiest locations in gaming ever! Combine this with the powerful music of Rik Schaffer and the mature handling of adult themes and you get an atmospheric dark RPG that fits the World of Darkness setting perfectly! Also impressive are the lengths the game goes to honor the source material. Besides the aforementioned Malkavians and their unique dialogs there’s the Nosferatu, hideous vampires that must avoid being seen at all costs and cannot dialog with NPCs normally, forcing you to make clever use of stealth.